New York Yankees starting pitcher Michael Pineda is suspended for 10 games after a pine tar incident on Wednesday night against the Red Sox. 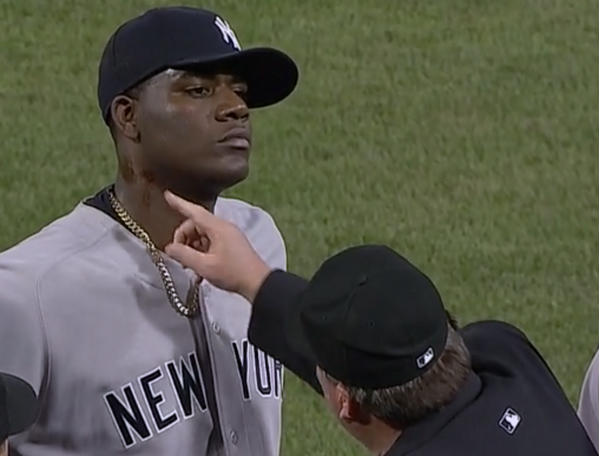 Pineda apparently had a substance on his neck and Red Sox manager John Farrell was quick to call to inspect Pineda’s neck. Pine tar is a sticky substance that is produced through high temperature carbonation of pine wood. Hitters apply pine tar to handle part of their wooden bat, as it gives them a better grip on the bat. Farrell called for the umpires to inspect Pineda in the 2nd inning, as Farrell already suspected a substance that looked dark slathered on his neck. Pineda was ejected in just the 2nd inning as a result of his actions. The Red Sox went on to beat the Yankees 5-1 that night. This incident is a direct violation of MLB’s Rule 8.02, which states, “A pitcher shall not apply a foreign substance of any kind to the ball.” Pineda was last seen with pine tar on his pitching hand on April 10th, where he beat the Red Sox. At that point in time, the Red Sox noticed it, but did not complain to the officials. However, this game was different.